So, my friends, Cathy and Melissa, love them some Disneyland. They are frequent visitors and I love their collection of Disney things that pop up in their knitting bags. On a recent trip, they brought back our knitting group a souvenir. One kids bracelet with the elastic out of it. The result? 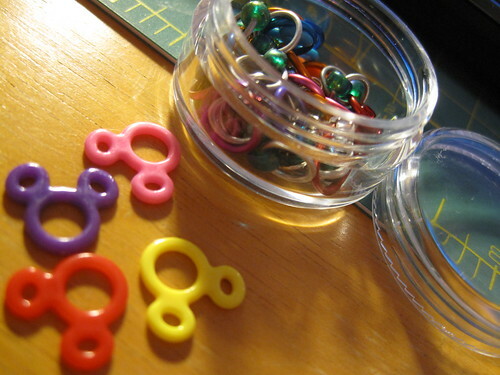 Stitch markers! Pretty smart if you ask me. Each of us in the group took a little handful to add to our stitch marker collections. I can't wait to use them!